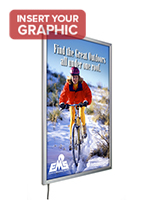 This LED light box is especially sized to hold movie and cinema posters! 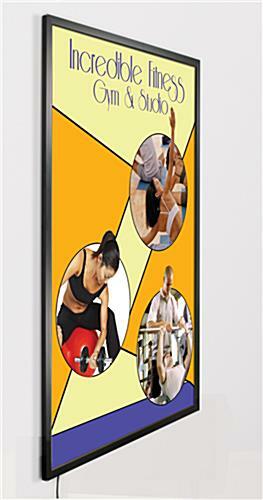 36" x 48" 36" x 72"
Powered by innovative LED technology, this poster light box offers bright, even lighting in our thinnest profile ever! 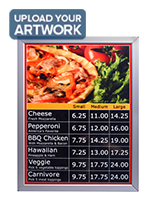 Measuring just .83" thick, this poster light box is one of the most elegant-looking light box displays on the market. 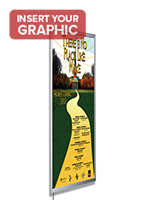 With tiny LED bulbs built into the sides of the frame, each poster light box illuminates your translucent graphics to create a stunning visual display with no hot or cold spots. 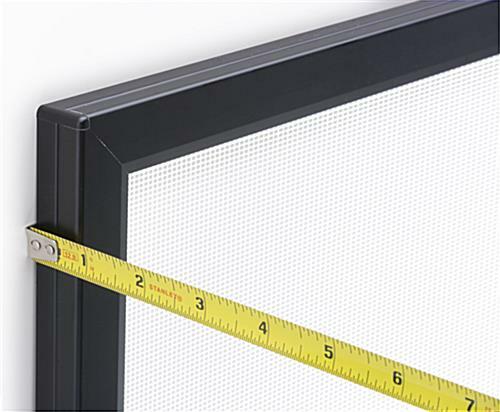 A diffusion pattern in the frame ensures that all you see is bright, shadow-free illumination, even in very large sizes. 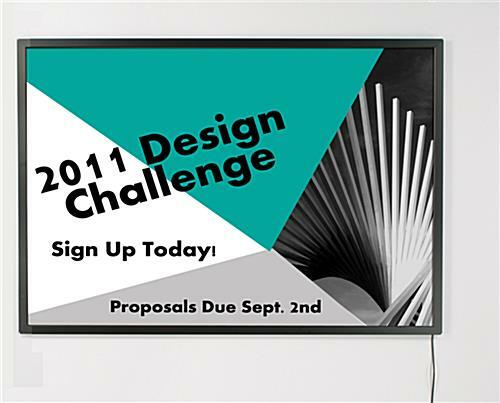 With a "snap-open" border on the frame, this poster light box is also very functional. 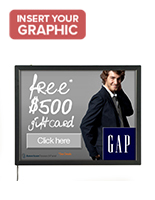 You can change your graphics with little effort without even removing the panel from the wall. 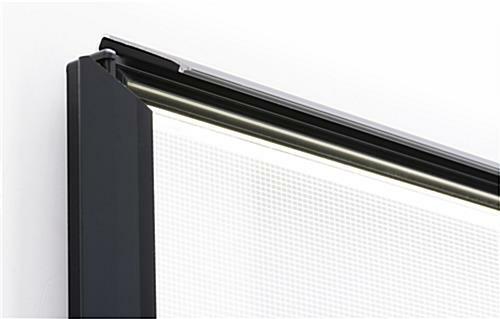 Four predrilled holes allow you to mount your poster light box vertically or horizontally, while rounded corners ensure no one gets scratched on sharp edges. 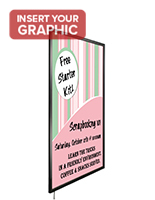 Although it initially costs more than a traditional light panel, this poster light box has many benefits that help outweigh its expense. 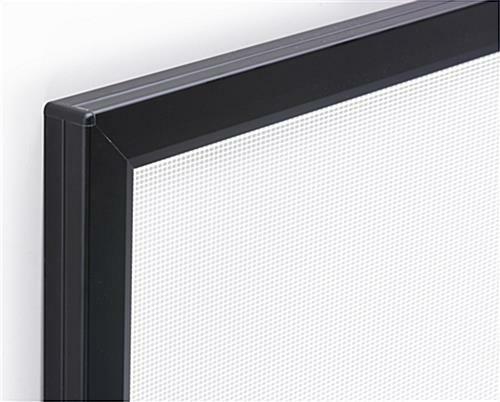 Because LED bulbs are smaller and more efficient than fluorescent bulbs, this poster light box is thinner and will actually save you money in the long run (in electricity bills). Each LED light box also has a life span of over 100,000 hours when used 24 hours, 7 days per week. That means you won't have to worry about changing your bulbs or replacing your light box display for over 11 years! 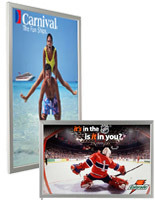 Because of its long life span, an LED light box makes a great permanent fixture in airports, malls and stadiums. 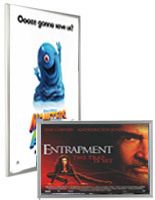 At 27" x 41", this poster light box is also perfectly suited to hold standard sized cinema posters. Please Note: LED lights are not measured in terms of Kelvin; our best approximation is a 6500 Kelvin color rating. However, we do not warrant this measurement, as it is only an approximation by us. The manufacturer of LED lights does not officially measure Kelvin Color ratings. 27.9" x 41.9" x 0.75"